A growing number of Americans are realizing that “good jobs” aren’t coming back, and that for things to get better, they’re going to have to fight to turn their McJobs into something better. There’s a line in Johnny Paycheck’s 1977 hit song that goes “I’d give the shirt right off my back, if I had the guts to say . . . Take this job and shove it, I ain’t working here no more.” In the past year, fast-food, retail, and warehouse workers have shown they do have the guts — but instead of quitting, they’re fighting back. From New York to California they’re taking to the streets. They’re fighting for a living wage, for respect from their bosses, and in some cases, for the right to form a union. Back in June 2012, eight immigrant workers peeling crawfish under sweatshop conditions for C. J.’s Seafood (then a Walmart supplier) went on strike in Louisiana. They stayed out for weeks, demanding an end to forced labor, wage theft, and other unfair labor practices — and they won. Following up on the C. J.’s workers’ successful action, Walmart warehouse workers in California and Illinois walked out in September, calling for improved workplace safety and a fair wage. A month later, Walmart associates walked out at 28 stores in twelve cities. The strikes marked the first time in history that Walmart retail workers had ever gone on strike, and were quickly followed by more strikes and demonstrations on Black Friday, the biggest shopping day of the year. Walmart workers took a breather after the fall strikes, as they battled an NLRB lawsuit brought by the company and strategized their next action. But low-wage workers in other cities quickly picked up the baton. 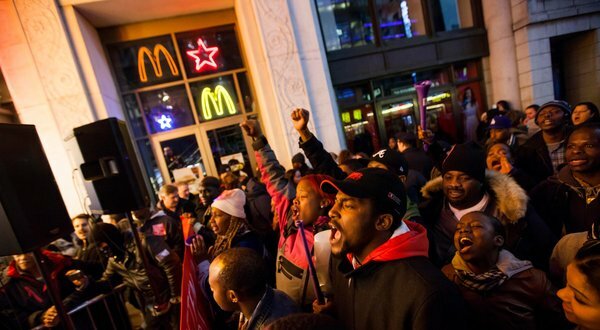 On November 29, hundreds of fast-food workers staged a one-day strike in New York City. The walkout marked the launch of Fast Food Forward, a new coalition of workers, unions, and community and civil-rights groups working to increase the wages of New York City fast-food workers. By April of this year, more workers were ready to join the fight. In a wave of strikes that would last through June, fast-food and retail workers in New York, Chicago, Seattle, Milwaukee, St. Louis, and Detroit walked off the job. Pickets popped up at KFC, Jimmy John’s, Chipotle, Target, McDonald’s, Burger King, Popeye’s, Long John Silver’s, Subway, Sears, Victoria’s Secret, and dozens of other establishments. On August 29, a day after the fiftieth anniversary of the March on Washington, workers took to the streets again. Thousands of workers in nearly sixty cities participated in work stoppages, demanding $15 an hour, respect from management, safe working conditions, better hours, and the right to unionize. What has sparked this upsurge? It’s hard to say. Unions have been trying to gain a foothold in the low-wage service sector for decades — a task made more difficult by the declining bargaining power of unions like the United Food and Commercial Workers union (UFCW) in the face of grocery-industry restructuring. When unions were strong, their very presence pushed up wages and working conditions across the industry, and helped inspire workers hoping to organize a union, or move into existing union jobs in restaurants and supermarkets. Perhaps a major catalyst to the recent strikes is the nature of the “recovery” from the Great Recession. During the downturn, 78 percent of jobs lost were either mid-wage or high-wage jobs and, according to the Bureau of Labor Statistics (BLS), three out of five newly created jobs are part-time, low-wage jobs. A growing number of Americans are realizing that “good jobs” aren’t coming back, and that for things to get better, they’re going to have to fight to turn their McJobs into something better.